One of the largest minor planets in the asteroid belt. Refers to the Roman Queen of the Gods, Juno, wife of Jupiter. Interestingly, while her Greek counterpart Hera is known as a symbol of motherhood and the institution of marriage, Juno had more of a war-like and civic symbolical role. 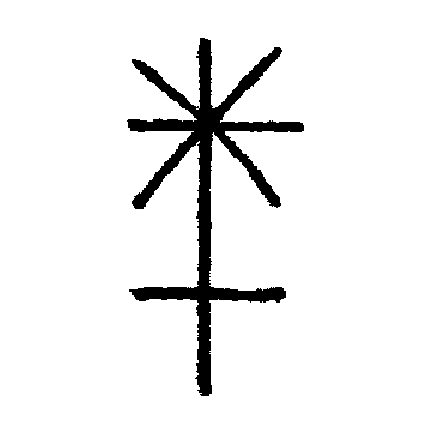 The symbol is a starburst over a feminine cross, symbolizing a scepter. It is a classical astrological symbol, but I do not know who originally devised it. It is represented in Unicode as U+26B5, by the symbol ⚵.